I am upset, because I just had an unsavory experience with an unethical merchant. Recently, I had the unfortunate opportunity to deal with a company called 86th Street Photo & Video (86photovideo.com). 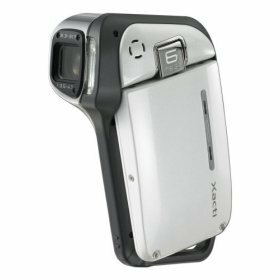 Last Friday, my wife placed an order online for a Sanyo Xacti VPC-E1 digital camcorder for $365 — what a great deal right? Wrong! This is the beginning of our problem. Man: “Most of our customers get the 1GB high-speed SD card” and he launched into why we needed the high-speed card as opposed to the normal one. Basically, he was using the “use the $30 coupon now, or lose” tactic to pressure us to make on-the-spot buying decision s. Now, that’s unethical up-selling. …what kind of lame B.S. is that? At this point, I’d canceled the order, but I still haven’t receive the confirmation from them yet. As a precaution, I also reported my credit card lost because my credit card information is now in the hands of an unethical online merchant (effectively stolen). I will also be filing this incident with the Better Business Bureau. After this debacle, we will be ordering our Sanyo Xacti VPC-E1 from Amazon.com, and stick to large reputable companies from now on. Sorry small business owners, but you know what they said, “one bad apple spoils the bunch.” This is another reason why it is so hard for small businesses to succeed. PS: If you purchased from them please add your rating and comment at ResellerRatings.com. I believe the three perfect 10s were done by 86th’s staff because they don’t rate anything else nor participate in the forum, but left perfect reviews for this store only. This is something that is at the top of my list of things I absolutely cannot stand. These “sales people”, or whatever you want to call them, are the most frustrating people to deal with out of anyone. I used to be more passive and allow them to give me their whole pitch and respectfully decline (often multiple times) when they tried to upsell me or push products on me that I didn’t want or need. Now I am not as nice; I will stop them in their tracks and not allow them to finish their sentence before telling them I am not interested in anything other than the product or service the call is regarding. You need to be tough on these people or they will walk all over you. This is an all too familiar story, one that I empathize with as I too have been a victim of unethical up-selling – or just unethical sales altogether. One thing I noticed is that is it always the online shops that don’t have a brick and mortar establishment close enough for you to just go to in person that tend to rely on these unethical business practices to make their money. After one too many experiences like this, I have almost completely stopped ordering anything online unless it is from a trusted reseller such as Amazon. What these sales people fail to realize is that they are driving business away by trying to force products down customers throats instead of giving them a pleasurable buying experience that makes them want to come back again. They might make an extra few bucks in the short term, but their list of returning clients is few if any. On a big picture scale, it isn’t necessarily the sales people’s fault; its the person who trained the sales people. People who don’t have knowledge of sales etiquette whether learned through school or experience shouldn’t be doing it in the first place. I just had a very similar story to those of yours, and I thought I had enough checking on them before I decided to “buy”, since it was too good of a price to be true. And oh SURPRISE I have, very unethical and poor customer quality service. In addition of no product ever to be shipped to me. Product out of stock, will take about 2-3 weeks before it gets to us, we will e-mail you when we have a tracking number for you (I placed my order on Nov. the 5th), trying to view my registered account on their site does not work, it said “sorry, we have encountered an error. Please call us and tell us what you were doing when this happened” they kept switching my call to so many different departments after every few words I said, the funniest part is that I could assure you it always was the same person answering on the next coming extension. How clever to keep my mind busy thinking I was going to talk to someone, to help me to fix my account so I could review this tracking number for my order ( sony HDR-SR12 120 Gb Hard Driver High Definition Camcorder from 86photovideo.com), when he had enough I guess, on a very terminating tone ordered me to call back in like an hour. I did call back right away to try to cancel my Order and when they had inquired my Order Number, even before I finished mentioning the numbers this guy said: “Thank you, I have canceled your order. Bye bye” No time to ask for a cancellation Number or anything. Now I am trying to cancel my credit card. my Advice to everyone is DO NOT BUY FROM 86photovideo.com AT ALL. THE BIGGEST LIARS AT ALL EVER! On my little online buying experience. Sorry for the miss-spellings Spanish is my First Language. The biggest problem online businesses have is that they cannot rely on traditional security measures to detect credit card fraud. They can’t require a customer’s signature, check a photo I.D., or use a credit card terminal. Crooks don’t even need the actual credit card. With the appropriate account number (obtained in a number of ways, including phishing scams or PC hacking), expiration date and billing address of the cardholder, any moderately technically savvy thief can circumvent most online anti-fraud safeguards. If the card remains with the cardholder, he or she won’t freeze the account until they notice the unauthorized charges. To make matters even worse, an online business that accidentally takes a fraudulent credit card order is responsible for the loss, including a chargeback fee of up to $25 (U.S.). An international website used by criminals to illegally buy and sell credit card details has been shut down, it emerged today. (Oct 17, 2008 BBC). 86photovideo.com does not sell anything! It sells card information may be. D. Cantrell – Sorry about your experience. Unfortunately, there’s a lot of immoral electronic stores out there. Before 86th photo, I went through a very similar experience as yours when I bought my first digital camera with lens/filters that are too small, extended-life battery that doesn’t work as well as the original, and a camera bag that’s too small. Glad to know I am not alone. Got the camera and the up-sell, “Because you are a first time customer.” The $150 lens filters do not fit on the camera. (I know — 150!! — I am a sucker, but “they are regularly $300, and they are on special today.”) The “free” camera case (because I “sound like such a nice guy” after buying the lens filters) is too small for the camera. Good thing it was “free.” The links on the website to track my order do not work, and someone else’s name and phone number came up when I log on to my account with them. When I finally got back through to them, they were unconcerned with this name error and told me to call back for customer service in three days. Needless to say, I have closed out my charge card. I did get the camera promptly. ($150 filters at least buy quick service.) In the end, I did get the $350 dollar camera for $230, but only after falling for the nearly $200 in extra junk — all at “deep discounts” just for me. I am usually not this stupid. In the end, my discounted $350 camera cost well over $500 with the filters and case I cannot use. Next time I’ll stick with someone I know. I had a similar experience with 86Photo this week (May 2 2008). As soon as I did not buy the additional items they wanted me to add to my order, I received an e-mail that the item I did order was on backorder. I won’t ever buy from 86Photo or use the LowPriceDigital website where 85Photo’s price was advertised. This is wholly inapprorpaite behaviour by the merchant and yet it’s surprising how often it can happen. I think your idea of cancelling your credit card was extremely prudent and I’d have done the same, who knows where you details would have ended up otherwise. I had the same problem with 86th street photo and also Broadway Photo. Broadway Photo = 86th Street photo. It’s the same call center handling both company….. Tried to buy a Panasomic Lumix camera. Got an email to verify my order. The guy representing Broadway Photo first tried to sell me a new battery and charger because the one that comes with it last only 20 minutes and charges for 8 hours! Then, he said the camera is an import from Japan and asked me if I speak japanese! 🙂 what a rip-off. There was no mention of this on their website, and the person I talked to at first completely lied to me. Also if you don’t buy anything extra, they will put your order on back order….guaranteed. I also think there’re 3 or 4 merchants operated from the same outfit with different phone numbers. I saw a GPS on their web page (www.86photovideo.com)…a Gamin Nuvi 660 selling for $301.00 I called to order here how it went! 86photo) Yes we do… you’ll need a memory card which are on sale at the moment. Me) Yes It’s the same GPS . Me) Finally after few complaining words I said Screw you… and hang up! We regret to inform you that the products you have ordered with our company are sold out temporarily. However, these products shall be available again within about 6-8 weeks from the date of this email. We would like to notify you that we still have not charged your credit card as of yet. Once we have the products ordered available again, we will send you another email notification and only then, you will be billed 24 hours prior to products shipment. If you would like to be on the backorder list for this product(s), just reply to this e-mail with the phrase “Please backorder order# (________) in the subject. If you would like to cancel the order just reply with the phrase “Please cancel order# (__________) and we will take care of the rest and destroy current information about your order. They are still in business and still doing the same thing. My wife and I just got finished canceling our credit card after falling for their scam (and before we saw all the warnings and posts about this place). How did this happen to us. Basically, they showed up on a price comparison web site, with the absolute lowest price and a “supposed” high rating. I now believe that they must run their own rating site. From that point on, it’s the same story as everyone else seems to report. We received an email to call them to confirm the order. We called ext. 203 for Steve and were told that we needed to buy batteries. But, this was for a Canon S5 IS, which uses “AA” batteries and includes them in the box! When we told him that he said “No, it requires additional, special, recharge batteries”, which he wanted to sell us – We declined. He then said we would need a memory card that we should buy. We declined that as well. He then told us that we would need an extended warranty. We declined that as well. He then said the camera was on backorder and would not ship for at least 2-3 weeks. We asked why, as their web site says “usually ships in 1-2 days” and he paused for a second and then said we could try to re-order it after New Years. We then asked to cancel the order. After that, we also canceled our credit card as this business seems to be in the business of getting personal information and credit card info without ever intending to sell anything unless you pay a 200-500% markup on non-necessary accessories, even to the point that they are not truthful about such (e.g., needing “special” batteries, when only AA batteries are required), etc. Please avoid this place and do some research before buying online. We certainly learned our lesson. I wish I had found this sooner. I bought a camera and had the exact same thing happen. @Zee – welcome to Moolanomy. Sorry to hear about the problem you had with them. I also filed my complaint with BBB. I think that’s the best we can do — unfortunately. Similar experience was mine for this web site. They tried to sell me different accessories and service plan; when I refused, I got the email that the product is back ordered. I called them and they coolly canceled the order. I have complained against 86th Street photo & Video at BBB web site…. don’t know if it will make any difference. I’m glad I took the time to look for information about this company. I was enticed by the $150 digicam they were selling (which Newegg.com, my preferred nerdjunk store, had for a depressing $230). I was wondering if it fell off the back of a truck *cough* or something. I did notice the bizarrely overpriced SD cards ($150 for a 1GB card? Are you on crack?) but I figured I’d just get one elsewhere. It was suspicious that they had a load of positive reviews, but only on a single SUPAR DEALZ ZOMG type of site, which is why I was looking for another review. Thanks for saving me a waste of time and cell minutes. @Karen – welcome to Moolanomy. I am glad I can help, and thank you for your input on small businesses. You may want to do a search on Deal Scans. I did a couple searches on there and thought it was quite good. @Chris – Welcome to Moolanomy. That’s what I intend to do now, but it’s a shame for other legitimate small businesses. I didn’t know buying bulky stuff like bunk beds on eBay actually works well. I haven’t been there for a while because you can really get hooked to the “winning” and ended up buying junks. Regarding local businesses, I do support them even if they are a bit more expensive. They are what make our neighborhoods a neighborhood. @Ana – You’re welcome and welcome to Moolanomy. After that experience, I’d definitely recommend you stay away from them. Good move on your part! I tend to use established stores with nearby phyiscal locations (CircuitCity, Best Buy, etc.) for big electronic purchases. They have the staying power and I know warranties and such will be honored. For other things, like a set of bunk beds, I used EBay and just read through pages and pages of ratings. I had a great experience with a small business when I needed somethings for my soccer team. The key was they were responsive, non-pushy, and service, not sells was their push. @Charlie – Sorry to hear that. I hope you can resolve the issue, and in the end, get what you wanted. Too bad there are people like this to make us miserable. sure wish i found this post earlier same story same store. spread the word.